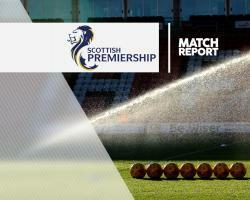 Dundee United's hopes of claiming an instant Ladbrokes Premiership return hang in the balance after being held to a 2-2 draw by play-off rivals Falkirk. Ray McKinnon's Tangerines were twice ahead in their semi-final first-leg clash at Tannadice as Simon Murray and Blair Spittal both struck. But equalisers from James Craigen and Joe McKee will give Falkirk belief ahead of Friday's Westfield return that they can finally escape the second tier after their two previous play-off attempts ended in failure. While United were battling past quarter-final opponents Morton, the Bairns had the luxury of an extra week's rest after pipping the Tannadice outfit to second place. But it was the hosts who came out looking refreshed as they took the game to Peter Houston's men. Murray turned Luca Gasparotto inside out but fizzed his strike a couple of yards wide while Tony Andreu failed to get enough power behind the ball after another Murray effort broke to him 12 yards out. However, United's perseverance paid off after 16 minutes as Murray put them in front. But instead of trampling on Falkirk further, the Tangerines allowed their opponents to grab a foothold as they found themselves pegged back after 27 minutes. The striker did well to hold it up before finding support runner Joe McKee, whose cross was turned into the net by Craigen's acrobatic effort. Bell then had to scramble to push away another Craigen effort as Falkirk finished the half on top. But United landed a beauty of a sucker punch on 59 minutes. Mark Durnan found Murray with an early ball forward but, when the former Arbroath man was crowded out on the edge of the Falkirk box, he did not panic as he instead sprayed the ball wide to Spittal. The youngster set himself with a touch then drilled past Robbie Thomson as he found the far corner of the net. McKee got plenty of bend on his strike but Bell will have to accept a share of the blame after allowing it to fly over his head into the net. Former Dundee frontman John Baird thought he had given Falkirk a precious lead with 11 minutes left but saw his header chalked out for offside, while Thomson denied United at the death as he clawed away Mikkelsen's late effort.